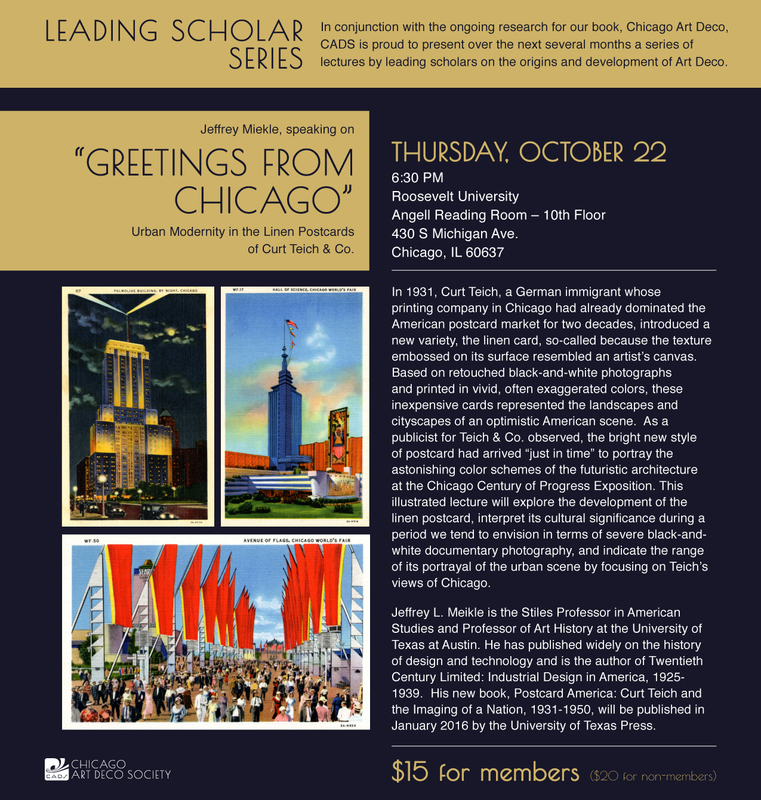 Chicago Art Deco Society - LECTURE: Greetings from Chicago- Urban Modernity in the Linen Postcards of Curt Teich & Co.
LECTURE: Greetings from Chicago- Urban Modernity in the Linen Postcards of Curt Teich & Co. In conjunction with the ongoing research for our book, Chicago Art Deco, CADS is proud to present over the next several months a series of lectures by leading scholars on the origins and development of Art Deco. "Greetings from Chicago - Urban Modernity in the Linen Postcards of Curt Teich & Co."
In 1931, Curt Teich, a German immigrant whose printing company in Chicago had already dominated the American postcard market for two decades, introduced a new variety, the linen card, so-called because the texture embossed on its surface resembled an artist’s canvas. Based on retouched black-and-white photographs and printed in vivid, often exaggerated colors, these inexpensive cards represented the landscapes and cityscapes of an optimistic American scene. As a publicist for Teich & Co. observed, the bright new style of postcard had arrived “just in time” to portray the astonishing color schemes of the futuristic architecture at the Chicago Century of Progress Exposition. This illustrated lecture will explore the development of the linen postcard, interpret its cultural significance during a period we tend to envision in terms of severe black-and-white documentary photography, and indicate the range of its portrayal of the urban scene by focusing on Teich’s views of Chicago. Jeffrey L. Meikle is the Stiles Professor in American Studies and Professor of Art History at the University of Texas at Austin. He has published widely on the history of design and technology and is the author of Twentieth Century Limited: Industrial Design in America, 1925-1939. His new book, Postcard America: Curt Teich and the Imaging of a Nation, 1931-1950, will be published in January 2016 by the University of Texas Press.